To create a Prime Rib soup you make things up! Soup from leftovers is improvisational cooking and experimentation. 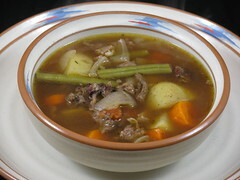 For Prime Rib soup trim off the excess fat – but still leave some fat on the bones and other scraps. Remember fat is flavour! You can always skim off the floating fat at the end of the cooking. Some recipes for Prime Rib just have you dump all the ingredients into a big enough pot and let it simmer away until done while adding pre-made beef stock or bouillon cubes for flavour. We will make our own stock base from the Prime Rib bones. Part of the reason I do this is to control the salt content. Because we are using leftovers that are seasoned it is a good strategy to wait before adding more seasoning. You can always add more of what is missing – but you can never take it back once it is in the pot! Place the bones (ribs) in a pot large enough to hold the bones and just cover with water. You do not want too much water at this point as it will dilute your flavour. Also add in the less choice cuts of prime rib meat you have in the left-overs. If you have some better slices of leftover prime rib save that meat for adding at the end. Next add to the pot 1 medium onion (whole), 1 or 2 cloves garlic, and the root vegetables of your choice. I like adding 1 parsnip root and 2-3 carrots. Make sure you have enough water to cover the contents of the pot. Set on stove-top and bring to boil. Then let simmer for at least 90 minutes. Longer is better. Remember you don’t want a full boil – only a slow simmer! Go find a good book and a glass of wine and do some reading! Remember the bones and meat are already cooked so what we are doing is extracting flavour. The longer you allow this to simmer the richer the broth! This is soup foreplay – so a long slow simmer helps to intensify the end result. While the stock is simmering you can prepare any additional vegetables you may want to add to the final soup. I like adding chopped celery, potatoes, peas, and mushrooms. You can also add a chopped carrot or two. Set them aside for later. Keep the potatoes in cold water so they do not turn black! When you think the stock is done (the meat will be falling off the bone)- take it off the heat and let it sit 15 minutes. Once the stock has settled you can skim off the excess fat at this point. Remove the larger items (bones, meat chunks, root vegetables, onion) from the stock and set aside for use later – or if you don’t like super-cooked veggies just toss them in the green-bin! Take a fresh pot and place a fine sieve over the fresh pot. Now gently pour your stock into the new pot. Time for the taste test! Get a small spoon and sample the stock. What does it need? Salt? Spices? More beefy flavour? Does it need a little more water? Or maybe some pre-made beef stock to add both volume and flavour. This is the part where you use the magic of your senses to make the soup your own! If I have leftover Prime Rib gravy I will add it to the stock. The gravy will thicken the stock so go easy! As well in go any leftover sauteed mushrooms I might have. Since these are already seasoned – make sure you add these before adding more salt! If I need more salt I will sometimes add 1/2 teaspoon of Marmite for flavouring, or a few squirts of Worcestershire sauce. You can now freeze your stock, or use some for the next step in soup making! Place the soup on the stove and bring to boil. Turn down to a simmer and let cook for 20-30 minutes or so (until vegetables are cooked to your liking. Barley also usually cooks in 30 minutes). IF you had leftover meat from the Prime Rib that you did not use in making the stock then you can add these choice bits of meat to the soup so the meat will be heated, and soften. Make sure it is cut into bite sized pieces. It is up to you when you add this meat – I add right away so it cooks for 30 minutes and falls apart. If you kept the bones and meat from making the stock, you can strip any better bits of meat to add back to your soup. The longer the bones and meat have cooked the easier it will fall off the bone and gristle. Add this meat back when the soup has finished cooking. If you are using Udon noodles you can add these at the end. Let your soup come back to a boil and the turn it off. Add black pepper to taste. At least one thing I wrote has an audience! Tried it out today and it went over big in the house. Thanks! Reblogged this on Servus Humillimus. I don’t want soup but now you have me completely obsessed with having meat. I eat meat once in a while. But, when I get the craving, I HAVE TO HAVE IT. My husband, when I mentioned it was not a fan since he is cooking a pork roast. (I don’t care.) We can have that tomorrow. I need steak. Tonight. Gee, Thanks for the craving. I’m going to ask my son…. Soup is always the answer! I find after the heavy and rich meals of the past few days soup is just what I am craving!